Organic Spirulina – is often deemed the most nutritionally complete superfood. It contains a rich supply of nutrients, including protein, complex carbohydrates, iron, vitamins A, K, and B complex. It also has a high supply of carotenoids such as beta carotene and yellow xanthophylls which have antioxidant properties. As well as beta carotene, spirulina contains other nutrients such manganese, zinc, copper, selenium, and chromium. These nutrients help fight free radicals, cell-damaging molecules absorbed by the body through pollution, poor diet, injury, or stress. By removing free radicals, the nutrients help the immune system fight cancer and cellular degeneration. Organic Wheat Grass & Barley Grass – has twice the amount of vitamin A as carrots and is higher in vitamin C than oranges. It contains all the B Vitamins as well as calcium and magnesium. In addition, both contain antioxidants, enzymes and other phytonutrients such as Superoxide Dismutase (SOD) that act as powerful detoxifiers of the liver and blood. SOD is one of natures most powerful antioxidant enzymes and has been shown to; lessen the effects of radiation; digest toxins in the body; protect cells from free radicals which contribute to the aging process and cleanse the body of any heavy metals , toxins or pollutants that may be stored in the body’s tissues and organs. Organic Alfalfa – contains the full spectrum of B vitamins, it is loaded with important minerals such as biotin, calcium, folic acid, iron, magnesium, potassium and many others.It has been found that regular ingestion of alfalfa can aid in flushing the bowels of built up toxins. Widely used for its diuretic actions, its is very useful for people experiencing water retention, urinary tract infections, arthritis and gout. The latter due to its ability to break down uric acid crystals located in the joints. Organic Chlorella – a single-celled fresh water algae, is the life blood of plants and is rich in chlorophyll. Chlorophyll carries high levels of oxygen (among other nutrients) which assists the body to restore cell and organ functions and a pH balance. Its high oxygen content helps deliver more oxygen to the blood which is very useful for the brain which uses 25% of the body’s oxygen supply. Chlorella has a number of health benefits which include; repairing nerve tissues, enhancing the immune system, normalizing blood sugar and blood pressure levels and promoting healthy pH levels in your gut which supports good bacterial growth. Organic Flaxseed Meal (Cold Pressed) – is one of natures richest source of Omega 3 (55-60% as Alpha Linolenic Acid (ALA)). Every human cell uses Essential Fatty Acids (EFA’s) to maintain a healthy cell wall and cannot exist without them. Our bodies can NOT make Essential Fatty Acids (EFA’s), so we must get them from food sources. Research has shown that Omega 3 can have beneficial results in many illnesses and conditions including – heart disease, cancers, diabetes, arthritis, asthma, premenstrual syndrome, allergies, inflammatory tissue conditions, water retention and skin conditions. Organic Inulin (Prebiotic) – is a polysaccharide, which is a soluble fibre classed as a fructan. Fructans are chains of fructose indigestible by our body, but loved by the good bacteria in our gut flora. Since our body cannot digest the fructans, Inulin has very little impact on blood sugar and unlike other sugars is not insulemic. A daily dose of the recommended intake of Inulin promotes immune system function, supports the cardiovascular system, and enhances the absorption of minerals in the body. Furthermore inulin can be vital for weight loss or calorie reduced diets, works as a digestive aid, and can be invaluable for diabetics. The Organic Inulin used in Green Boost is sourced from Jerusalem Artichoke. Organic Cinnamon – is loaded with anti-oxidants including polyphenols. In fact, Cinnamon is commonly ranked 3rd on the ORAC (Oxygen Radical Absorpance Capacity) scale which measures the anti oxidant capacity of foods. Most of cinnamon’s benefits on health and metabolism as well as its distinct smell and taste are due to the compound called Cinnameldehyde. Cinnamon has shown to be useful for, inflammation, blood sugar regulation and improved insulin sensitivity, heart disease by reducing LDL “bad” cholesterol and blood pressure and infections through anti-fungal/bacterial actions. 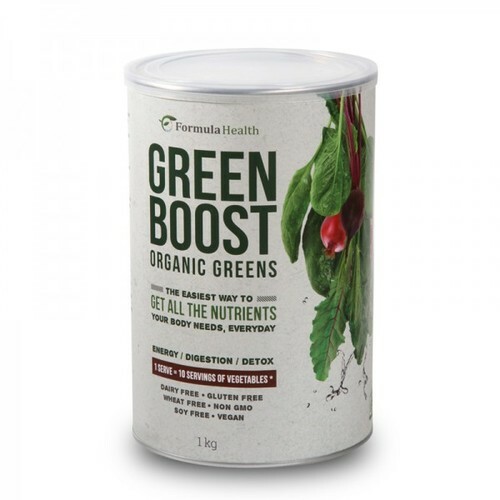 The organic cinnamon used in Green Boost is Cinnamon zeylanicum – “True Cinnamon”. Organic Dandelion Root – is a great source of beta-carotene, vitamin c, iron, calcium, magnesium and Luteolin, a powerful anti-oxidant. As well as being nutrient rich, most of the health benefits are attributed to its bitter tasting compounds. The effects of these compounds are contributed in helping its overall effect in maintaining a healthy digestive system. By improving liver function and promoting healthy bile flow, Dandelion root may assist with a sluggish liver, constipation and poor appetite as well as reduce cholesterol, weight loss, acne and protect cells from free radicals. Milk Thistle Extract (Silymarin) – is natures own liver protector and supporter. In addition to having numerous health benefits including, anti aging properties, free radical scavenger and supporting menopausal related symptoms, its main actions are exerted on the liver. These include; cell protection through blocking the entrance of certain toxins thereby slowing the progression of liver damage, also known as cirrhosis and uniquely having the ability to regenerate damaged liver cells to normal function. Plant Based Digestive Enzyme Blend (Amylase, Cellulase, Lactase, Lipase, Protease) – A multi-enzyme complex consisting mainly of amylase (starch hydrolyzing enzyme), protease (protein hydrolyzing enzyme) and lipase (fat hydrolyzing enzyme). In addition to these, it also contains cellulase (that hydrolyzes cellulose) and lactase (that hydrolyzes lactose). The enzymes in this complex are of microbial origin (fungal amylase, lipase, lactase, cellulase; and a bacterial neutral protease), entirely plant based that are derived from fermented grain (Aspergillus oryzae). Amylase…24,000 U/g, Cellulase…200 U/g, Lactase…4,000 U/g, Lipase…1,000 U/g, Neutral Protease… 6,000 U/g. This digestive enzyme blend facilitates the breakdown of carbohydrates, protein, fats and fibre which may assist digestive function and also be useful for allergies, fatigue and headaches. Bromelain – Is an enzyme that specifically digests proteins. Bromelain has been found to help your body digest food and absorb nutrients more efficiently, as well as being extremely effective at healing issues in the gastrointestinal tract. It may be useful for Inflammatory Bowel Disease, Ulcerative Colitis, Dyspepsia, Colon Cancer, Constipation and Crohn’s Disease. L. acidophilus & L. bulgaricus – thrive in the gastrointestinal tract; produce their own anti-biotics that help neutralize toxins and kill harmful bacteria and are beneficial in relieving IBS symptoms and diarrhoea. L. rhamnosus & L. casei – are stable in stomach acids of the gastrointestinal tract; are beneficial for anti-viral immunity, respiratory tract infections and reducing flatulent gas and diarrhoea. L. plantarum – are stable in stomach acids of the gastrointestinal tract and posses anti-microbial and anti-bacterial benefits. B. coagulans – spores activate in stomach acids then begin to germinate and proliferate in the intestines. Ability to improve vaginal flora, abdominal pain, Irritable Bowel syndrome (IBS) bloating and immune response in viral challenges. B. bifidum & B. breve – are two of the major genera of bacteria that make up the lower digestive tract flora. They have shown to exert a range of beneficial health effects, including inhibition of pathogens and harmful bacteria that may cause inflammation of gut mucosa. Organic Kale – is an excellent source of vitamin A (in the form of carotenoids), vitamin C, vitamin K, copper, and manganese. It is a very good source of vitamin B6, dietary fiber, calcium, potassium, vitamin E, vitamin B2, iron, magnesium, vitamin B1, omega-3 fatty acids phosphorus, protein, folate, and niacin. Kale is an especially rich source of glucosinolates, and once kale is eaten and digested, these glucosinolates can be converted by the body into cancer preventive compounds.